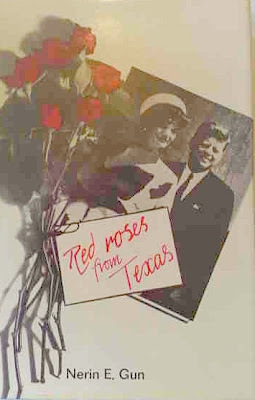 Bookride: Red Roses from Texas, 1964. "Three times that day in Texas we were greeted with bouquets of the yellow roses of Texas. Only in Dallas they gave me red roses. I remember thinking: How funny - red roses for me." Jacqueline Kennedy. Nerin Gun ( with Thomas Buchanan.) RED ROSES FROM TEXAS. Frederick Muller, London, 1964. Kennedy assassination conspiracy theory book --looks like a novel but is non-fiction. The 1964 British Muller edition is the only edition of this book and I don't think there is even a second edition. Something of a sleeper which I am slightly reluctant to awaken but as I am now in my anecdotage I am less guarded about these things. This is a book that looks like nothing, one of the first conspiracy theory books to appear after the Kennedy assassination and, so far, always exchangeable for a £100 note minimum. Gun was there, in Texas, and Mexico, for much of the time between the assassination and his subsequent publication. His asides, commentaries on Texas, political assassinations in general, the life and times of JFK, and the events that made November 22 unique, are well taken, but they turn a narrative into what seems like a series of essays or thought pieces. And, again, much is wrong. It wasn't 85 degrees in the shade that day, the SS were not all carrying submachine guns on the running boards, and half of the SS agents did not stay in Dealey Plaza. Nor were witnesses Harold Norman, Jr. Jarman, nor Bonnie Ray Williams cited. Instead we learn of "Negroes" under the sniper's window named Ralph Erwing and Washington Harris. Is it real or is it Memorex?????? VALUE? There are several copies on the web at between $500 and $800, with some guy on Amazon (often the source for the cheapest and also the most grossly overpriced copies of books) wanting $500 for a non-jacketed ex-library cop and a fine in fine example being available at $600 elsewhere. We have sold two very nice jacketed copies this century both at £220 each. The book is not especially scarce and can be found overlooked in a charity shop if you are lucky - and they are not plugged into the mainframe. Outlook? Eventually it will be reprinted or POD'd so not a book to hold. It has been about the same price for 5 years, so if you find a copy, sell it. We put a fine one on Ebay where it failed to make our modest reserve - confirming my feeling that, unless you have something very trendy or very rare Ebay's customers tend to be bargain hunters, cheapskates and bottom feeders. At least that's why I go there! Copy of Red Roses from Texas sold on Ebay UK a few days ago for £33.00. Nerin E. Gun is a liar.